One of things I tell my undergraduate and graduate students at the start of the semester is: “Your success in this course will be determined by your ability to follow instructions.” Invariably, the students with the highest marks follow instructions, while those with the lowest marks ignore instructions. The same is true for Lean transformations. The ability of a leader to transform an organization from conventional management to Lean management is determined by their ability to follow instructions. Think about some of the leading Lean success stories: Art Byrne’s leadership of The Wiremold Company (see Better Thinking, Better Results) and Dr. Gary Kaplan’s leadership of Virginia Mason Medical Center (see Transforming Health Care). These leaders listened to their kaizen consultants – in both cases, Chihiro Nakao, the leader of Shingijutsu USA. They followed Mr. Nakao’s specific instructions as well as his general guidance whose purpose was to help them in their own discovery and learning process. Think also about the notable Lean failures, such as Tesco, whose leaders ignored the instructions and guidance from the people whom they hired for help (e.g. former TMUK people), or the many Lean failures across entire industries such as aerospace. This reminds us of an important requirement that most top leaders do not possess, and which limits their ability to follow instructions and guidance from sensei: Humility. Most top leader cannot let go of their current batch-and-queue knowledge and practices and acquire new Lean knowledge and practices. Related to humility is another important characteristic: Curiosity. Most top leaders are incurious. Art Byrne and Gary Kaplan are humble, curious leaders who are eager to learn new things and ry them out. And, when something does not work out as planned, they try again and again and again. They don’t give up after the first try as most leaders do. In most organization, you cannot even tell the boss when they are wrong. Hierarchies, unwritten protocols, and organizational politics block information flows, which assures that important information remains hidden and work that needs to get done doesn’t. Needless to say, leaders who do not like to hear the truth cannot follow either specific instructions or general guidance. Their Lean transformations are domed to failure from the start. In his book The Lean Turnaround, Art Byrne also talked about taking an occasional "leap of faith" which is a scary phrase for any C-level executive. Even when the Shingijutsu consultants' instructions ran counter to what Art believed was right, he forced himself and his management team to make a pact and to implement what the consultants told them. For a CEO to act this way takes courage, humility, and steadfast dedication to the cause. Bob and Jason; well said on both accounts. In less than a week I’ve had two clients say these same things to me. It was refreshing indeed coming from leaders but then again the one has saved eighteen million dollars in eighteen months (by their CFO’s accounting not mine) because he humbled himself and did as instructed. The other will begin their lean journey this January 11th after seven months of considerations and ‘counting the cost’ in terms of personal involvement; ‘Mark we want you because you will hold us (leaders) accountable and make us do the right thing. You won’t let us go the wrong way when we will inevitably want to at some future point.’ He and his team ‘get it’. 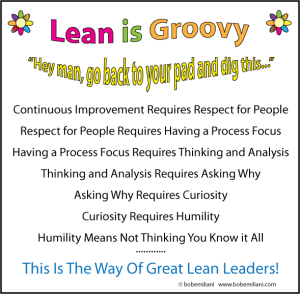 Their Lean Transformation’s success is entirely predicated upon them as leaders ‘humbly listening to and learning from someone else’. This is going to be FUN!